Hello and welcome to the 247th installment of the SWD. Harakat Nour al-Deen al-Zenki and Hayat Tahrir al-Sham reached a temporary truce agreement last night that lasted until the noon. The agreement was mediated by the Saudi sheikhs Abdullah al-Muhaysini and Musallah al-Olayan. The director of media office of HNDZ, Ahmed Hamahar announced today that the truce agreement was extended for an indefinite period, as the negotiations are still taking place between the two parties. Hayat Tahrir al-Sham foiled Syrian Arab Army’s attacks on Hijara and Al-Rashadiya in the southeastern Aleppo countryside. Military commander in Hayat Tahrir al-Sham, Edi Abu Faisal claimed that more than 30 SAA‘s soldiers were killed and two tanks damaged. Other reports suggest that SAA lost three soldiers and HTS one in the clashes. 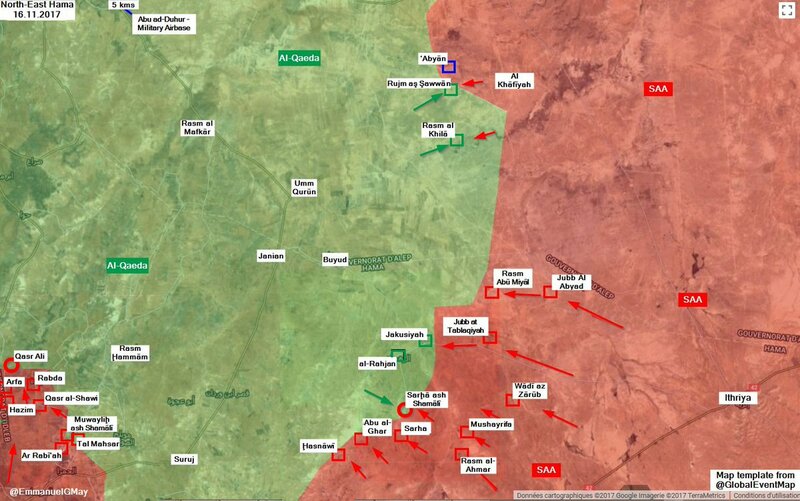 Syrian Arab Army backed by the National Defense Forces reportedly captured Hardana and Qasr Ali from the rebel forces, in the northeastern Hama. On a different front, SAA recaptured Sarha Shamali from the Hayat Tahrir al-Sham. Hayat Tahrir al-Sham’s Ibaa News Agency reported destruction of SAA‘s tank on Tallat Sarha with an anti-tank guided missile. Free Syrian Army’s Jaysh al-Izza and Hayat Tahrir al-Sham repelled Syrian Arab Army’s attacks on Al-Balil and Umm Turikiyah. According to the reports, eight SAA‘s soldiers were killed in the clashes. Syrian Democratic Forces’ Deir al-Zour Military Council captured Dhubayn from the Islamic State. The leader of the military council, Ahmed al-Khubail confirmed the capture of the locality. Islamic State’s Amaq Agency claimed death of eight Syrian Democratic Forces’ fighters and injury of additional ten, due to the clashes between the two, southeast of Al-Omar field. Syrian Arab Army and allies advanced north of Albu Kamal (Al-Bukamal) and reportedly captured Hamdan village and Hamdan airbase. 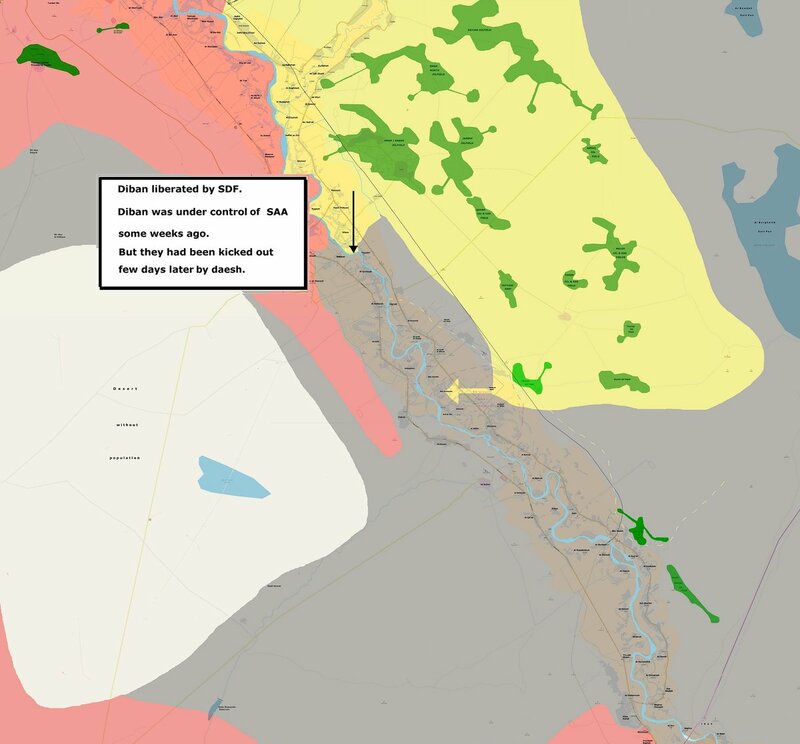 After these advances, the Islamic State is reportedly encircled in Al-Bukamal. Ahrar al-Sham’s spokesman Omar Khattab, and Ahrar al-Sham’s spokesman for the East Ghouta, Mundhir Fares, stated that the ‘Army Armored Vehicle Base’ in Harasta is still not under the full control of the AAS-led rebels, as the SAA reportedly controls one point in the locality. Fares added that the rebels seized large quantity of food, part of it from the UN aid. Syrian Arab Air Force targeted Saqba, Hammouriya, Douma, Arbeen, and Ain Terma. Five people were reportedly killed in Arbeen due to the airstrikes. Syrian Civil Defence (The White Helmets) reported death of two people in Hammouriyah and one in Ain Terma, also due to the airstrikes. Rebel shelling of Damascus’ center reportedly killed one person and injured 13 others. Commander of the ‘1st Infantry Brigade’ in the Free Syrian Army’s Firqat al-Hamza, survived an assassination attempt on the road between Inkhil and Barqa. The deputy of the brigade, Adham al-Wadi stated that the commander was injured by an improvised explosive device which targeted his vehicle. Al-Wadi accused IS-linked Jaysh Khalid ibn al-Walid of trying to assassinate the commander. Rebel “Daraa Martyrs Documentation Office” reported death of an Ahrar al-Sham fighter, after he was wounded by the Syrian Arab Army’s improvised explosive device at the outskirts of Al-Naimah. Islamic State and Iraqi Army clashed in the village of Al-Marbat, southwest of Kirkuk. According to the Amaq, five Iraqi soldiers were killed and three wounded in the clashes. Islamic State’s improvised explosive device damaged Iraqi Army’s Humvee in Al-Tarmiyah. Iraqi Security forces conducted operations in Al-Muhasnah, Al-Gharan, and Tal al-Dhahab areas, south of Baghdad. Security forces found three improvised explosive devices, 15 various mortar shells, three grenade launchers, several hand grenades and explosive materials left behind by the Islamic State’s fighters/cells. Additionally, several wanted individuals were arrested in the operations. Yusuf Demir, an ISIS media official with links to ISIS networks throughout the Middle East and Europe, killed Oct. 26, 2017 near al-Qaim, Iraq. Omer Demir, an ISIS external operations coordinator with links to ISIS networks in the Middle East and Europe, killed Oct. 26, 2017 near al-Qaim, Iraq. Abu Yazin, an ISIS senior leader and weapons facilitator, killed Nov. 3, 2017 near Mayadin, Syria. Abdellah Hajjiaou, an ISIS external operations plotter, killed Nov. 5, 2017 near Abu Kamal, Syria. Islamic State took responsibility for the suicide attack that occurred in the downtown Kabul today. According to the Amaq, the attack targeted members of the ‘Islamic Society’. Nine people were killed in the explosion, seven of them members of the Afghan National Police.